- Save this as copymove.reg > save as all files > and place it on your desktop. - Double-click on it and merge the contents to the registry, click YES/OK. Always backup your Registry before making any edits. 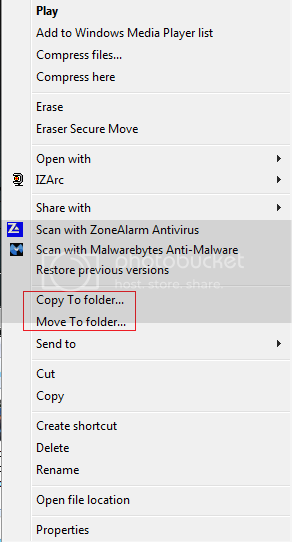 Even easier is to click and drag with the right mouse button instead of the left and when you drop the file somewhere, Windows will prompt whether to Move or Copy the file. But you need to have the drop location open/visible, I found in right click its easy especially if your moving/copying more then one file. i personally like to visibly see the folder the file are going to. kinda like "yes, this is the right folder"
i also have all my folders very well organized, so i can quickly find the folder via the sidebar to the left in a window. but i think there are other people out there that will have great use for it. I will give this ago my self..